In this paper, I characterize Ethno-Wiki-Virtual-World-Graphy as a new digital methodology for tourism studies, science & the social Sciences in relation to my upcoming Harbin Hot Springs Actual/Virtual Ethnography: "Naked Harbin: Hippies, Warm Pools, Counterculture & Clothing-Optional, Virtual Harbin." I further examine the significance of this in relation to my tourism studies' paper from 2001 "Gazing at the Box: Tourism in the Context of the Internet and Globalization (Internetity)" in terms of modernity, post-modernity, advertising discourse and Internetity (the information age). I then suggest ways in which a film-realistic, interactive, 3D and group-buildable virtual Harbin / virtual earth / virtual universe in something like in Google Streetview/Maps/Earth with OpenSim/Second Life will and can be used in both science and social science for research. I'll conclude with ways brainwave headsets and similar will be incorporated for research with this. Emerging from the University of Toronto Press's publishing of Marshall McLuhan's "The Gutenberg Galaxy" in 1962, as well as UC Berkeley Professor Manuel Castell's book "The Internet Galaxy" (Oxford 2001) which comes into conversation with McLuhan's book, I suggest here that a virtual Harbin / virtual earth / virtual universe in Google Streetview/Maps/Earth with OpenSim/Second Life, as wiki and for STEM research, especially ethnography too, which is explicitly explored in my actual/virtual Harbin anthropological book, will lead beyond McLuhan and Castell's thinking to a new film-realistic 3D interactive build-able wiki-informed virtual earth galaxy. Scott MacLeod's research focuses on the anthropology of information technology and counterculture. 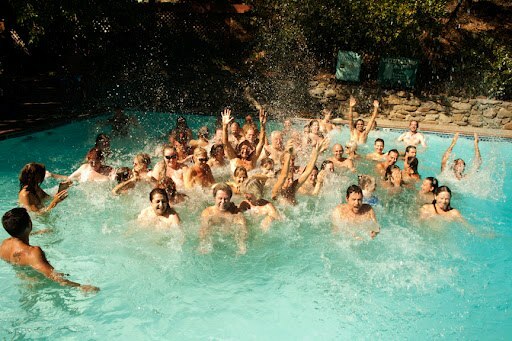 He's written an ethnographic book, "Naked Harbin" about Harbin Hot Springs in northern California, with a virtual world aspect, due to be published in 2016 - http://www.scottmacleod.com/ActualVirtualHarbinBook.html. He's the founder, president, CEO, a faculty member and presiding clerk of wiki CC World University and School (which is like CC Wikipedia with best STEM Creative Commons' licensed OpenCourseWare and planning to accredit on CC MIT OCW in 7 languages and CC Yale OYC - http://worlduniversityandschool.org). Scott continues to teach "Information Technology, the Network Society and the Global University" regularly on Harvard's virtual island (not on Harvard University's faculty) in Second Life, and in Google group video Hangouts. He's teaches both anthropology and sociology.